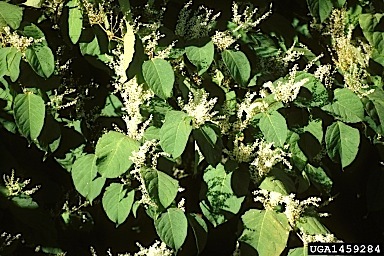 Habit: Perennial, herbaceous shrub 3 m (10 ft) or taller; shoots survive one season; rhizomes survive decades; circular clonal stands formed in native habitat, senescing centrally. Reproduction: Primarily vegetatively via rhizome or shoot fragments; by seed; dioecious; or gynodioecious; viable, fertile hybrid (F. x bohemica) result of cross with F. sachalinensis (also non-native and invasive). Leaves: Simple and alternate; broadly ovate, 8-15 cm long, 5-12 cm wide (31⁄8-6 in x 2-43⁄4 in), with abruptly pointed tip, truncate base; stipule (ocrea), a tubular, membranous sheath. Stems: Round, sometimes ridged, glaucous, often mottled; hollow internodes with swollen nodes. Flowers: Mid-late summer; small (2-3 mm or 1⁄8 in), greenish-white, 1,000s/plant; narrow inflorescences at middle/upper nodes; fly and bee pollinated; copious nectar, from which bees produce a dark, quality honey. Fruits/Seeds: Fruits 3-winged, 8-9 mm or 1⁄4-3⁄8 in; seeds (3-4 mm or 1⁄8 in) dark, glossy; germination rate 61-95% in light and room temperature; no apparent cold stratifica­tion requirement; wind, possibly water dispersed (like rhizome and shoot fragments); at least one bird species eats the seeds. Habitat: Native to Asia; introduced to the U.S. in the mid-late 1800s; disturbed and riparian areas, roadsides, woodlands; shade intolerant; native substrate volcanic with low pH; grows in a variety of pH levels and soil types; preference for wet habitats; seedling survival dependent on water; adults tolerate drier conditions; USDA hardiness zones 4-8. Comments: Tetraploid, hexaploid, or octoploid; polyploidy may increase genetic diversity; translocates N to radial clones until clones take up own N; most N in roots if N is limiting; C remobilized to rhizomes prior to shoot senescence; treatment for skin disorders, hepatitis, inflammations, natural estrogen substitute; exudes large quantity of guttation fluid; grazed by sheep, cattle, horses; F. japonica var. compactum also escapes. Similar Native Species: Virginia knotweed (P. virginia- num); not a shrub; ocreae with bristles; inflorescence a slender spike.